The nine letters from April 1945 see Christmas gifts from home finally reaching the Philippines on the 15th, just as the rainy season is about to begin. Walt reaches 300+ combat hours, and wonders if he should stick out waiting for a promotion to Captain or come home—he makes it sound like it’s his choice. 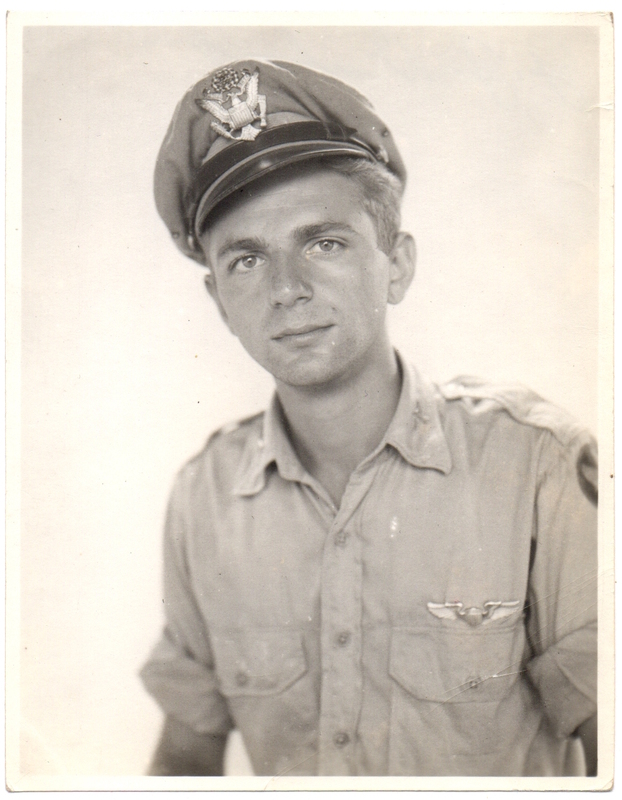 Even though he hasn’t received his promotion yet, he receives the Air Medal and the Distinguished Flying Cross following his being shot down in January. I’ve posted a photo of Walt’s Air Medal before, along with the Purple Heart, but I don’t have his Distinguished Flying Cross. It has gone missing somewhere over the years. I have replicas of all the medals, given out by some organization very late in Ruth’s life, but she refused to attend that ceremony for her own reasons, so I’m not going to show the replica of the DFC. The March 1945 letters are finished. During March, Walt reveals that he has 270 combat hours in and that he expects to have as many as 400 by the time his tour is finished. He has been made the C Flight Leader and hopes to be a Captain soon. On the 23rd, he sends some interesting photos of the homemade squadron bar, where he obviously spends a good amount of time. It’s been almost a year since he’s seen Ruth, but he’s hoping the time will go fast until he can return home. I never mentioned it when it started happening, because I guess I thought it was a fluke, but I wonder why Walt quit numbering his pages. It had been such a habit throughout 1942 that I thought it would never end. Is it easier for me to center the text for a page number or to write the bracketed unnumbered page? I go back and forth on that question. There aren’t many letters in these first two months of 1945, but they contain a lot of interesting information. In January, Walt is shot down and spends a few days in a raft before being rescued. He goes on a 10 day leave to Sydney in February, which eats up most of the month. He learns of his promotion to 1st Lt. while he is on leave. If you ever read of P-51’s doing anything over here you’ll know it is us. The December 1944 letters, and all of 1944, have been transcribed. Walt does a lot of flying in December, but his little group of four—Franklin, Garner, DuBost, and Walt—take a few hits. The year ends with Garner and DuBost on their way home with injuries, and just Franklin and Walt left to fly more missions. Finishing out the year, Walt finally gets his own Mustang, which is already named Ruth-less, a sign he takes as lucky, since the previous pilot got to go home. The unit is moving somewhere as December ends, and Walt hopes to get into a little fun, as he calls it. His mother, as he says, would call it devilment. The November 1944 letters are finished and it was an interesting month of letters. It begins with Walt having returned from a trip to Sydney, Australia, anticipating getting some flying missions where he can shoot down an enemy plane, but some of the realities of air warfare hit close to home. His friend J. J. DuBost takes a hit and loses some fingers, or a hand, depending on the storyteller, and is probably headed home. By the end of the month, Walt has been involved in a friendly fire incident that shot down a US plane (he was able to recognize it first and not shoot). He is grounded for a few days during the investigation, but quickly returns to his anticipation of being part of some “hot” missions.